Sorry about the delay in getting this one up. It’s been sitting in Draft status..anyway on with Sundays review. Sunday was always going to be the busiest day with a pretty full lineup of Music as well as some guest speakers that would draw crowds. It was fairly obvious why they scheduled Cate Blanchett to be on nice and early so the lines to catch the bus from the Belair Train station area were already pretty long and that was before Midday. I had concerns given the previous days the only buses I saw running from there to the festival were the small city of Mitcham buses but thankfully they had some large buses interspersed to move the larger crowds on Sunday. It ended up only being a 15 minute wait before we were on our way. 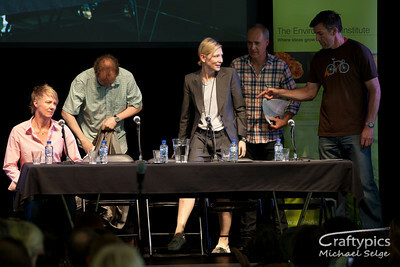 The first event was the discussion on which Cate Blanchett was on the panel of speakers and as expected all seats were already taken. I took up a position mid way down the tent on the side but unlike the other speakers the festival management insisted that all Photographers were only allowed down the very back of the tent and could only take photos of Cate for 5 minutes. Got my shots and headed off to catch the Kronos quartet play again. Despite a few technical glitches with the PA system whilst the quartet had to wait for the tech guys to fix it, it was a great and varied performance. Next up were the Catholics on the Karka stage. I quite enjoyed them with their Jazz influences and stayed and watched quite a bit of their set and cracked my first beer for the day. Back to the Internode stage for the Emma Donovan band. The two backup singers added a lot to the sound and they really looked like they were enjoying being there. Paris Wells was the next act back on the smaller Karka stage. I’d heard of her but didn’t really know what to expect. I was pleasantly surprised and she looked the part on stage with bright red lipstick, blonde hair and massive earings swinging from each ear. Konono #1 from the congo was a bit of a surprise. Being mainly percussion and rhythm based I was hoping for some good beats and wasnt disappointed. They had many in the crowd up dancing at the front of stage. I found that after about 15-20 mins that most of their songs sounded very similar to the ones they had already played, however this didnt matter to the swelling crowd of people that took off their shoes and danced in the lush grass. 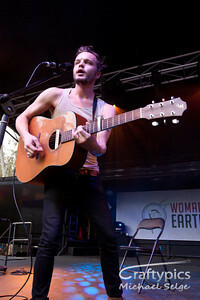 The Tallest man on Earth was one of my Sunday highlights. Up on stage by himself with just a guitar I could see why some reviewers regard him as being in the same mould as “Dylan”. Great sounding songs, good lyrics and a stage presence that you could just feel as he strutted around. I had to leave early to start heading down to the Internode stage and caught the end of Rod Quantocks talk ” Bugger the polar bears this is serious “. Rod is one of the funniest guys around and even catching only 10 minutes of his performance I left with a massive smile. 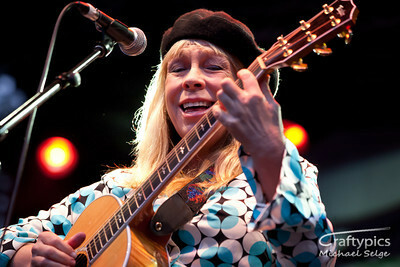 One of the headline acts was Rickie Lee Jones. She may have a few more wrinkles that she had 25 years ago but still has an amazing voice. She played a mix of some old stuff and some of hr newer material, and I wasnt at all surprised that she didn’t play here most famous song ” Chuck Es in love “. 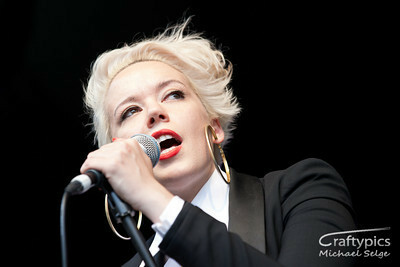 People I spoke to afterwards who were massive fans were mesmerised by her performance. With the night approaching I went back to the Karka stage to see the Shanghai Orchestra again play on the smaller stage. They were playing mainly solo parts and it wasnt that conducive to taking photos so I grabbed a glass of red wine and sat on the fringe area listening and relaxing. With the night drawing to a close it was back to Stage 1 for the final 2 acts. The Kronos quartet again this time with 2 speakers ( one on each side ) who read quotes as the Kronos quartet played. It was quite effective. Rain started to lightly fall which was actually quite welcome at the end of the evening. When the Kronos quartet had finished the stage was cleared and a piano rolled in for the final act – Abdullah Ibrahim. The crowd had thinned by this stage with many weary or having to leave to get connecting buses/trains but for those that stayed he put on a great show. It was fairly laid back Jazz influenced music but it suited the final event. There were a few kids that headed down the front and danced around with streamers. It was entertaining for a little while but personally I found it quite distracting as we weren’t there to watch their “performance”. I didn’t stay for the whole of Abdullahs set as after three nights and 2 days of lugging 10 kg of camera gear around I was bushed so I bid farewell to the park and headed home. Sundays schedule of bands was pretty packed unlike Saturday when their seemed to be periods of nothing much happening. I would have liked to have had time to listen to some of the speakers, however being there as a photographer meant I spent more time at the performances. I mean How many photos can you take of speakers ? Would I attend again – definitely. Is there room for improvement – definitely.